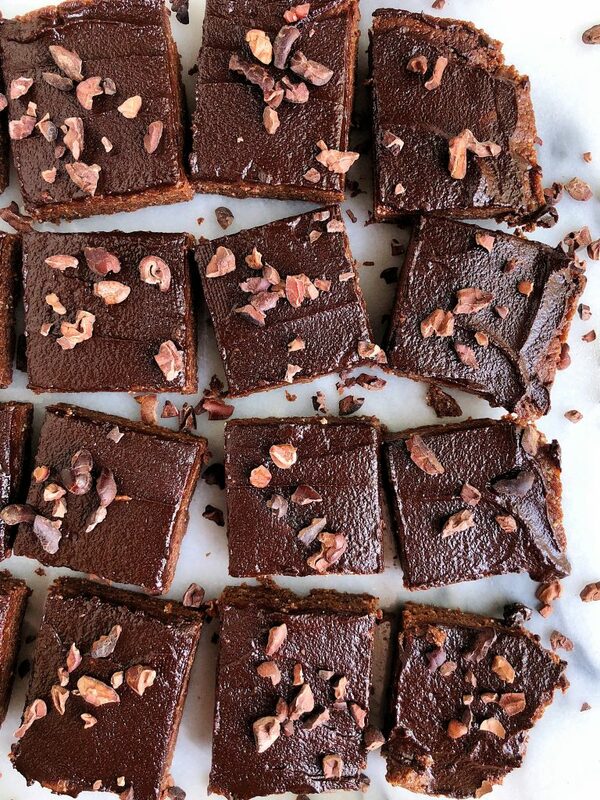 No-Bake Fudge Brownies made with gluten, grain and dairy-free ingredients. Sweetened with manuka honey, no dates for a twist on your usual no-bake dessert! These brownies are a DREAM. They’re the ultimate dessert for the summer. Especially when you don’t want to turn your oven on and are sweating your tush off outside. But just because you don’t want to turn on oven on, doesn’t mean you won’t be craving some chocolate desserts, ya know? Allow me to present to you, No-Bake Fudge BROWNIES! This super simple recipe is gluten-free, dairy-free, oil-free and has NO dates. Most no-bake desserts have dates and while I do love them, it is nice to switch things up sometimes. 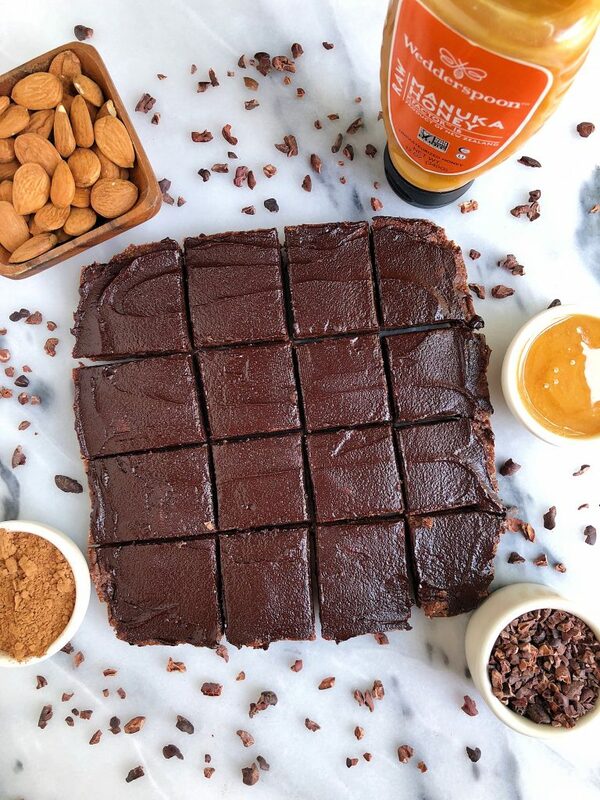 I use Manuka honey to sweeten these brownies up and they are the perfect amount of sweetness (at least for me!). I always use Manuka honey from Wedderspoon. Amongst many other things, I like to know where my food comes from and trust that the brand is providing top notch products for us to enjoy. Wedderspoon’s honey is KFactor, which means it has a holistic multi-stage authentication system named for the key facts in their honey. It is a rating system that is compliment with New Zealand’s standards. Wedderspoon also sources all of their Manuka honey in New Zealand to ensure it is the highest quality and standards. It is also raw unpasteurized, meaning that it is lightly filtered and gently warmed. It has all the naturally occurring live enzymes still. How amazing this that? Thank YOU, Wedderspoon! And for that crazy good squeeze bottle that makes my honey drizzles so much easier. When you make these brownies, don’t forget to top them off with some chocolate ganache, you will love! Don’t forget to share these with me on social media when you make them! 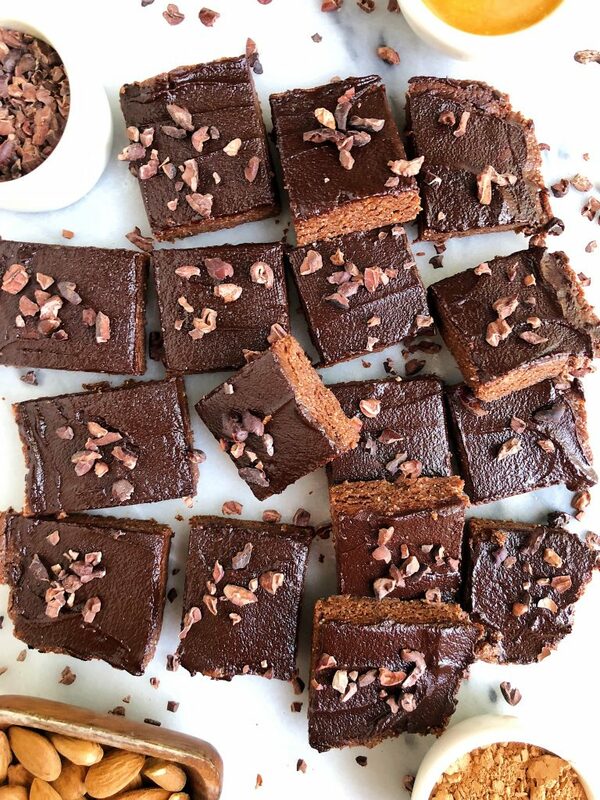 And here are few of my other recipes using Manuka honey: Dark Chocolate Tahini Freezer Bars, Peanut Butter Truffle Bars and Paleo Twix Bars. Store in the fridge for up to a week or freezer for a few months! Thank you Wedderspoon for sponsoring this post. It means so much to me to work with brands I love and believe in! I am so excited to try these! That texture looks so rich and fudgy…and love how these are filled with heart-healthy fats and no bake as well!